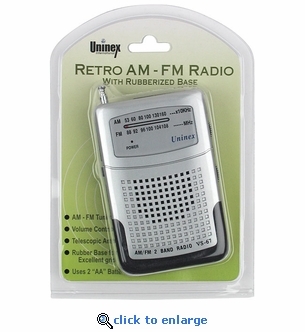 The Uninex AM/FM pocket radio with retro styling is a high-quality compact radio that's easy to take anywhere. Perfect for listening to music, sporting events or keeping informed during emergencies. The rubberized base makes the radio easy to hold. Compact Size, Fits in Pockets, Purses, etc. Headphone Jack (earphones not included). Rubberized Base for Added Grip.